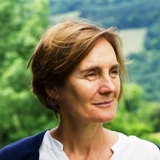 The virtues of Jane Clarke's writing include a broad sympathy that never usurps the voice of the other, that guides the reader to understanding and respect; a pleasure in ingenious objects and crafts that is deftly transmitted; and a clarity which does not deny mystery but makes room for it. - Eiléan Ní Chuilleanáin, Ireland Professor of Poetry. Jane Clarke grew up on a farm in Co. Roscommon and now lives with her partner in Glenmalure in Co. Wicklow. Her first collection, The River, was published by Bloodaxe Books in 2015. Her second collection, When the Tree Falls, will be published by Bloodaxe Books in September 2019. All the Way Home, an illustrated sequence of poems in response to a soldier's letters from the Front during World War 1, was published by Smith|Doorstop in April 2019, in collaboration with the Mary Evans Picture Library, London. In 2016 Jane won the Hennessy Literary Award for Emerging Poetry with three poems from The River, 'For Isobel', The Blue Bible' and 'Every Tree'. She also won the inaugural Listowel Writers' Week Irish Poem of the Year in the Irish Book Awards 2016. The River was shortlisted for the Royal Society of Literature's Ondaatje Prize, given for a distinguished work of fiction or non-fiction evoking the spirit of a place. She was also included in Poetry Ireland Reviews's 2016 Rising Generation Issue. Previously, she won the Listowel Writers' Week Poetry Collection Prize 2014 and the Trocaire/Poetry Ireland Competition 2014. She also won the Poems for Patience Competition 2013, the iYeats International Poetry Competition 2010 and Listowel Writers' Week Originals Competition 2007. Her poems have been published in The Guardian, The Daily Telegraph, The Irish Times, The Irish Independent, The Herald (Scotland), Poetry Ireland Review, New Hibernia Review, Resurgence & Ecologist Magazine, The North, The Rialto, Poetry Wales, Acumen, The Compass Magazine, Agenda, One Poetry Journal, The Stinging Fly, Prelude, Abridged, The Irish Literary Review, Orbis, Ambit, Mslexia, Envoi, The Interpreter's House, One, Southword Journal , THE SHOp, Cyphers, Crannog, Skylight 47, Galway Review, The Stony Thursday Book, Revival and Boyne Berries. Jane has had poems broadcast on RTE Lyric FM and on Radio1's Sunday Miscellany, Arena and the Poetry Programme. She has poems in Reading the Future, New Writing from Ireland (Arlen House & Hodges Figgis, 2018), New Roscommon Writing 2014-2018 (Roscommon County Council 2018), Metamorphic: 21st century poets respond to Ovid (Recent Work Press, 2017), Washing Windows? Irish Women Write Poetry (Arlen House, 2017), Tokens for Foundlings Anthology (Seren Books, 2012), The Roscommon Anthology (Roscommon Literary Heritage Group, 2013), the 2009, 2012 & 2014 Fish Anthologies and in the English & Spanish editions of IB Theory of Knowledge Course Book (Oxford University Press, 2012). Her poems are displayed in Galway University Hospital and The Hawk's Well Theatre, Sligo. Jane edited Origami Doll, New & Collected Shirley McClure (Arlen House 2019) She co-edited, with Nessa O'Mahony, the Irish issue of the prestigious UK poetry journal, The North, Issue 61, January 2019. She has performed her work extensively at festivals, readings and concerts throughout Ireland and in England, Wales, France, Spain and the US. In 2009 Jane was selected for the Poetry Ireland Introductions Series. She was awarded a Literature Bursary by the Arts Council in 2017 and an Artists' Support Bursary by Wicklow County Council in 2009 & 2019. 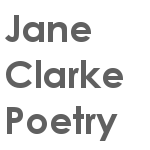 Jane has judged the New Writing Prize 2018 in the Cúirt International Festival of Literature, the Trocaire/Poetry Ireland Poetry Competition 2016 & 2017; the Rush Harbour Festival 2017; the Los Gatos-Listowel Festival Poetry Competition 2016; iYeats Poetry Competition 2015, WOW Writing Awards 2015; Allingham Literary Festival Poetry Competition 2015; Roscommon Writing Competition 2014. Jane attended Fuerty National School, the Convent of Mercy, Roscommon and won an Irish scholarship to the Lester B. Pearson United World College on Vancouver Island, Canada. She holds an Honours Degree in English and Philosophy from Trinity College, Dublin and an MPhil in Writing from the University of South Wales. She has a diploma in action research from the University of Bath and a diploma in group analytic psychotherapy from the Institute of Group Analysis, UK. She worked in community development, adult education and psychotherapy in Dublin for 15 years. She now combines writing with her work as an independent consultant providing facilitation, team building and leadership development to public service and not-for-profit organisations.